How Do You Subtract Fractions with Different Denominators? Subtracting fractions with unlike denominators doesn't have to be a nightmare. Just find a common denominator and everything calms down! See how to keep your fraction subtraction calm with this tutorial. How Do You Multiply Fractions? Working with fractions can be intimidating, but if you arm yourself with the right tools, you'll find that working with fractions is no harder than working with basic numbers. In this tutorial you'll see the process for multiplying 3 very simple fractions. Enjoy! How Do You Add Fractions with Different Denominators? Trying to add fractions with unlike denominators? You're going to need a common denominator first! 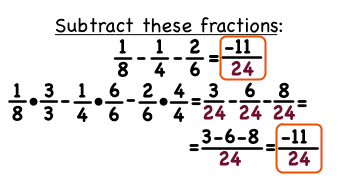 Follow along with this tutorial and see what you need to do to add these fractions together.